Roux-Y-gastric bypass (RYGB) is highly effective in treating obesity related type II diabetes mellitus (DM). There are a few studies from the Middle East and North Africa (MENA) on the impact of RYGB on DM. The aim of our study was to evaluate the impact of RYGB on DM in our patient population. We retrospectively reviewed our database and selected obese patients with type II DM who underwent primary laparoscopic RYGB from 2005 to 2015. Complete remission (CR) of DM was defined as HbA1c < 5.7%, FBG < 100 mg/dL without medications. Partial remission (PR) was defined as HbA1c 5.7–6.4%, FBG 100–125 mg/dL without medications. Improvement was defined by a significant reduction in HbA1c (> 1%) or FBG (> 25 mg/dL) or reduction in HbA1c and FBG accompanied by discontinuing insulin. Out of 245 RYGB patients, 107 had DM. In comparison, diabetic patients were older and had more hypertension and dyslipidemia. 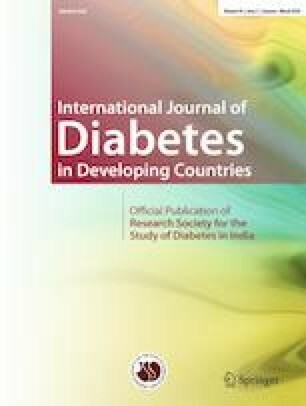 At 5 years with a follow-up (F/U) of 56%, total weight loss in diabetics (24.7%) was lower than non-diabetics (27.7%). At a mean F/U of 5.6 ± 2.7 years, range (1.4 to 10.7), there was a significant reduction in HbA1C (7.9 to 6.1%), FBG (158 to 111 mg/dL), intake of oral hypoglycemic (73.6 to 29.7%), as well as insulin therapy (15.4 to 2.2%). The rate of DM CR was 42.3%, PR 20.5%, improvement 23.1%, and no change 14.1%. This is the first report from the MENA region on the long-term outcomes of RYGB in the treatment of type II DM. The results are similar to those in the international literature.